Variable frequency drive (VFD) applications face unique challenges when managing electrical current. Without proper planning, these applications can experience many issues, including disrupted network communication, inaccurate process performance, power loss, motor failure and cable destruction. Also known as current noise, common mode current is current induced in paths outside the primary motor phase conductors and returns to the drive through any ground path. This noise can compromise the surrounding systems, resulting in system downtime or erratic network communication. The errors and anomalies caused by it are often hard to diagnose and to fix. It can even destroy the motor bearings and cause premature motor failure. The role of the VFD cable is to provide the best path for potentially harmful currents to return to the drive, preventing or mitigating a variety of potential system issues. A “real” VFD cable is designed with effective grounding to keep current within the cable and to minimise the ground path flowing outside of the cable, eliminating the disturbance to surrounding equipment, networks and/ or instrumentation. Fig. 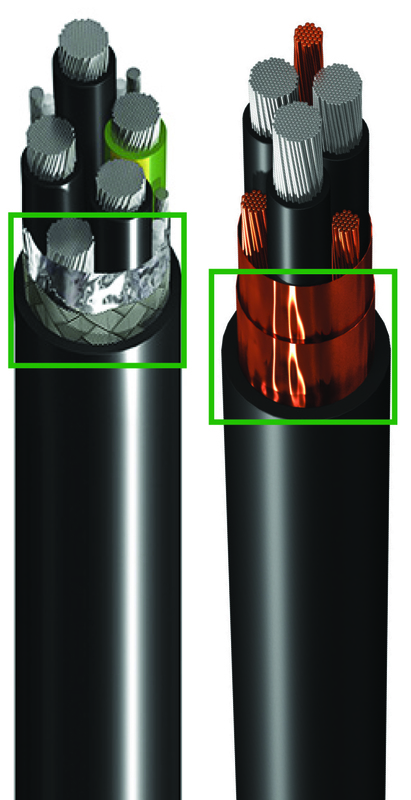 1: These two cable designs show the most effective shielding options – using a combined foil and braid instead of only foil, and using two spiral copper tapes, instead of one. The best main way to prevent common mode current is to use VFD cabling with high amounts of copper content. More copper will more effectively keep all electrical noise within the cable. Cables with the equivalent of three full-sized phase conductors – 300% ground – in the ground system will be most effective in containing common mode noise. Many VFD cables are made with less than one full-sized phase conductor of copper in the ground system, which complies with the NEC standards but does not protect the system effectively. Systems with smaller drives tend to be more likely to see issues with common mode current because of faster switching devices, larger drive-cable mismatch and the reduction of output filtering in more basic drive products. Capacitive coupling or cable charging occurs when energy leaves a drive and is displaced or lost, and ends up charging the conductor or interacting with other cables. When this happens, the delivery of power from the drive to the motor is reduced. This capacitive interaction can induce voltage in adjacent cables, leading to the presence of voltage on de-energised circuits, causing safety concerns and shock hazards. The resulting power losses are related to the cable length and the interactivity between conductors and motor leads. The worst-case scenario occurs when multiple sets of motor leads with high capacitance are run together in conduit. There are two main ways to reduce the impact of capacitive coupling and cable charging. One is by shielding the motor lead sets from each other to prevent capacitive interaction. The second method is to achieve the lowest cable capacitance possible through proper VFD-grade insulation materials and thicknesses. This is a high-voltage electrical pulse that originates at the motor. This voltage pulse has the potential to damage the motor or motor cabling. It is a common problem in VFDs with longer motor leads. Induced voltages and system failures as a result of unsuitable cable selection create risk to both personnel and operational reliability. Use cables with the lowest capacitance or least ability to store electric charge to minimise or mitigate reflected wave voltage. This increases the cable distance required to reach full reflected wave voltage. While VFD cables can’t completely eliminate reflected waves, they are the safest and most robust solution available to manage the waves and to make possible longer cable runs. To accomplish this, look for cables with the proper insulation thickness and material. While there are many drive systems operating today with thermoplastic high heat-resistant nylon-coated (THHN) in conduit, these systems often cause issues that are not recognised. Wet THHN, for example, has a very low dielectric breakdown voltage. Under some circumstances, the reflected wave voltage may exceed the breakdown level of the insulation. Typically, this failure mode will not be catastrophic, but will cause nuisance trips such as ground faults that may occur infrequently, but can be extremely difficult to troubleshoot. In some cases, while the system may initially seem to function properly, the accumulation of system noise and bad practices will lead to more anomalies and failures over time, compared to a properly cabled system. It is important to select a properly designed cable system and to use products that can withstand harsh conditions and electrical challenges. Cabling in a VFD system must carry power from AC drive systems to AC motors. As a result, the cables must not only handle high power current, but also the high voltage that can occur. In the past, typical cabling solutions have included unshielded tray cables, single conductor THHN wire or continuously welded armoured cable (CCW). Not only do these products require complex, costly installation and introduce potential problems, but they also have proven to be ineffective in handling common mode current (noise) and voltage spikes or protecting against capacitive coupling. Most, including CCW, contain only the minimum ground copper required to comply with the NEC standards. THHN wire, for example, uses a thinner insulation and has an inflexible nylon coating. While it is inexpensive, THHN wire isn’t built to withstand the challenging conditions facing VFDs, which often create the noisiest signals in the entire plant. When faced with noise, high-voltage pulses and other factors, THHN wire insulation breaks down over time, not only destroying the cable, but ultimately causing system trips or failures. For these reasons, the manufacturers of motors and drives do not recommend using THHN as it can have detrimental performance and reliability implications. Using cables for VFD applications will reduce downtime from both cable failure and the adverse effects of poor cable selection. A reliable and safe cable choice in combination with proper installation helps manufacturers to avoid downtime and troubleshooting. VFD cabling offers better process stability, more system uptime and overall improved reliability and safety. Only VFD cable is designed to protect plant equipment by extending the life of motors. By running motors at the required speed for the load instead of at full speed continuously – and being able to change speed instantaneously – the motors do not wear out as quickly. VFD cabling also protects against wear on the motor bearings and helps motors to avoid overheating. When comparing the cost of cables, THHN wire may appear cheaper per metre than VFD cables, but users must also purchase and install conduit that increases overall installation costs. VFD cables do not require conduit or the associated installation costs. In addition, if the design or location changes, VFD cables can be moved easily . With recent advancements in VFD cable technology, it’s now easier to bend VFD cables around tight turns or corners and in motor junction boxes. This flexibility is the result of a more bendable thermoplastic elastomer (TPE) jacket and finely stranded tinned copper conductors – these can now have over 2000 individual stands in a single cable. VFD cables can also be mounted directly on a motor or drive. Installation is also critical. Even the correct cable must also be installed properly to be effective . Without proper specification and installation, it’s possible to emit noise and affect other equipment and systems. 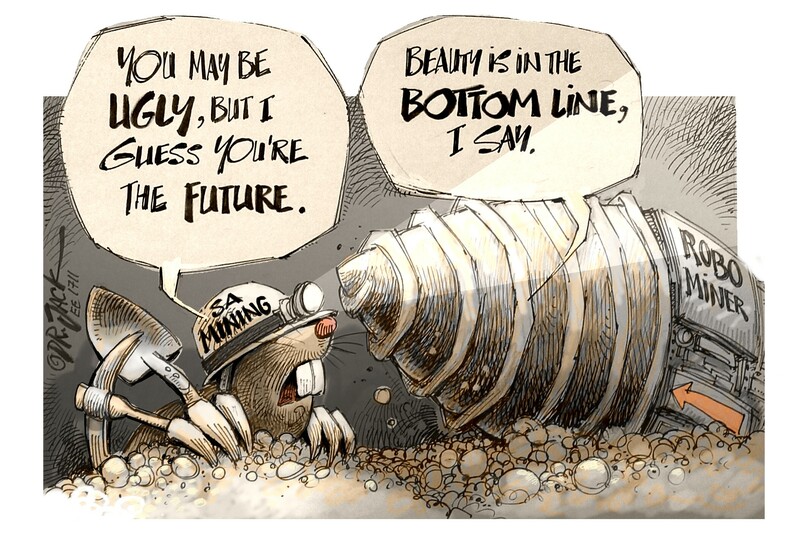 Improper termination also increases the potential for such effects. Some VFD applications are for automated manufacturing, which requires a high level of intense flexing. Others are designed for motors that are in constant motion since they are mounted directly on machines. Since there is currently no standard to govern VFD cables, consider these important attributes to achieve a well-designed system (see Fig. 1). Robust ground and shielding systems will protect equipment from disruption. Cable shielding prevents interaction between systems. Essentially, the type of shield on a cable is the cable’s primary defence against noise emissions. Most generic control cables, as well as THHN wire, have either aluminium shielding or no shielding at all. To minimise radiated and conducted noise, consider the cable’s copper at ground potential. For smaller, noisy drives, select a VFD cable with more ground copper content. To calculate this, take the circuit conductor size and multiply by three. This 300% increase is how much copper the cable should use to mitigate the noise and bond the motor and drive. For larger, quieter drives, the ideal ground size is 100% of the circuit conductor size. The shielding system works with the full sized grounds to mitigate noise. Real VFD cable is designed with effective grounding to attract current within the cable, minimising the ground path flowing outside the cable itself. Insulation wall thickness and the material itself combat voltage spikes within a cable. THHN and generic control cables use polyvinyl chloride (PVC) and nylon insulation, which is not recommended by drive manufacturers. PVC is also more susceptible to absorbing moisture and can result in significantly reduced insulation strengths in wet or damp environments. Response to temperature is another important consideration. Thermoplastic insulation, found in THHN, generic control cables and some low-cost VFD cables may degrade and break down at higher temperatures. VFD-grade XLPE insulation, however, is safer and more tolerant of high temperatures. Conductors affect system reliability through assured connections and proper design for high-frequency performance. The greater the conductor surface area, the better the system performs. Tinned copper is the best conductor material choice for rugged environments and reliable connections. Unlike bare copper, tinned copper will not oxidise at high temperatures. High-strand tinned copper circuit conductors offer superior high-frequency transmission paths and better containment of common mode current. They also have a higher flex life, are more resistant to vibration and corrosion and are easier to install. Stranding is also critical. Finer stranding enables cables to bend more easily and to take tighter turns during operation and installation. Ultimately, cables should never be the weak link in a VFD system. When selecting cabling, pay special attention to the cable’s shield/ground system and its copper content, VFD grade insulation type, and thickness and capacitance. “Downtime costs auto industry $22 k per minute”, http://news.thomasnet.com/companystory/downtime-costs-auto-industry-22k-minutesurvey-481017 (accessed March 2006). Termination video for foil/braid designs, www.youtube.com/watch?v=POpB8LlfGnE. Termination video for copper tape designs,www.youtube.com/watch?v=YrhA08_Auz8. National Fire Protection Association (NFPA), www.nfpa.org/. NFPA79 Electrical standard for industrial machinery, 2015 edition, www.nfpa.org/codes-and-standards/all-codes-and-standards/listof-codes and-standards?mode=code&code=79.